It’s probably impossible to ever fully explore Greece, but I’d love to shake the hand of anyone who has. My obsession with this country began when I started studying Classics in university. I actually didn’t have the the slightest idea what Classics was all about — I just didn’t know what to declare as my minor. Turns out I made a great choice. Last year was my first time visiting, and I travelled extensively throughout the islands (including some pretty remote destinations). Greece lived up to my expectations, and I’ll be definitely going back to cover some of the islands I missed soon. Here’s what I learned, in the meantime. I started out in February on Santorini, which is pretty dead but an interesting experience just the same. Athens was lovely for visiting at this time, as mild temperatures meant I could explore the Parthenon without being destroyed by sweltering weather. Things get ultra crazy in the summer months, but I was told that September and October are actually the best time to visit. The Mediterranean is still warm, and tourist crowds have abated. I prefer the ferry service for getting around, although many major islands have airports. Even the smaller islands often have airports, but my experience at the Naxos one left me in such terror I doubt I’ll ever attempt that again. Your resource for plotting travel is www.gtp.gr. Most islands will have public transit, with the exception of Hydra, which has NO transit other than donkeys. For real. Greece is divided into many different regions, so depending on your time, you’ll want to plan accordingly. Ferry routes can be time consuming. The most popular routes tend to be in the Cyclades areas, where it’s easier to go island hopping. You can’t come to Greece without swinging by Athens. I know it gets a bad rep, but it’s one of my favourite cities. Here’s all the reasons I love Athens. You can cover most of everything with three full days, but if you can, take a trip to the coast and visit Cape Sounio at sunset. The Temple of Poseidon is pretty rad. I stayed at AthenStyle my entire type in Athens. Easily one of my favourite hostels ever. There’s so much to do on the Mainland! Most popular visits tend to be Meteora and The Oracle of Delphi, which are both well worth the trip. But don’t overlook Ioannina or Thessaloniki either. I wrote about it here. I spent a month in Santorini, living in a gorgeous cave just outside the main town (Fira) at Cave-Land. This is the most prolific of all the islands, thanks to its dramatic caldera rising hundreds of feet from the sea. It’s a big island though, so it deserves a few days. I wrote this guide to Santorini in the off-season. When I came back later in May, the atmosphere was much different…and way more crowded. Still, it’s quite an incredible place. I recommend staying in Fira, or near Fira, for easy access to everything. 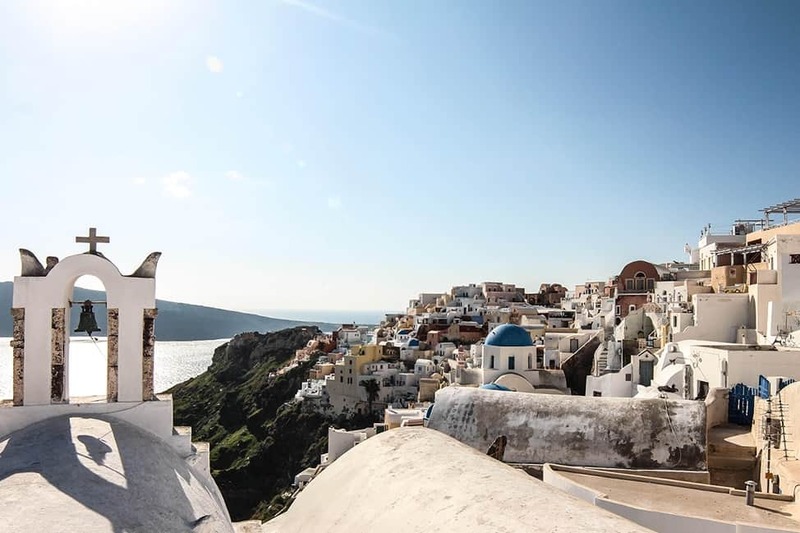 Oia is usually the main draw — the classic blue-domed postcard destination — but Fira is more relaxed and affordable. On my second trip I stayed at Hotel Villa Manos, a SUPERB hostel/hotel with a great pool just a 15-minute walk from Fira town. Kamari and Perissa are two of the black sand beaches on the other side of the island, but they can turn into wild party scenes at night. If that’s your thing, give ‘er. Visit Akrotiri, an ancient settlement that was wiped out by Santorini’s volcanic eruption. Take a cruise out to see the volcano (it’s the view of Santorini that’s actually worthwhile, though). Hike from Fira to Oia along the caldera’s rim, and visit Atlantis Bookstore. For eating? Santorini is well known for its culinary wonders. (And its unique wines!) I COMMAND YOU to go eat at Tsipouradiko on the main road to Fira. It’s still one of my favourite restaurants in the world. Other than that, most Greek tavernas are failproof. Easily one of my favourite islands, thanks to its variety of life and landscape. You get the best of everything here: gorgeous little Greek towns, lots of beachy goodness, mountainous landscapes, and outdoorsy adventures. Note that it’s a HUGE island though, and at least five days is required to make the most of your time here. Head to Chania first — that’s my recommendation. I did a lot of driving on this island, but the highlight was definitely hiking Samaria Gorge. Naxos is slooooow. I didn’t do a whole lot here, because I was a little drained and feeling blue. I came around mid-March, and the place was pretty void of tourists. But the main town is beautiful, and the portara (doorway) is a must-see…especially at sunset. There are a handful of museums and other attractions around as well. Read this guide. It’s a good place to slow down. I’m often torn between saying Crete or Ios is my favourite island, because both are very different. Ios is completely idyllic, but much smaller, and its main draw is partying and socializing. I had the greatest time here ever. The locals are friendly beyond words, and prices are cheap. Stay at Francesco’s — the best family-run hostel ever. Although the beach hotel may be more enticing, it’s better to just rent a four-wheeler to hit up the area during the day, because most of the nightlife takes place in the centre town. I didn’t love Mykonos nearly as much as Ios, but I had a great experience at San Giorgio Hotel. Where Ios is the low-key party place, Mykonos is a full on rager. And I mean FULL ON. Paradise Beach and Super Paradise Beach is full of rowdy people downing expensive bottles of champagne…and it’s a lot of fun, but exhausting. The main town is beautiful but filled with designer shops, etc. The eating and service here is fab, though. Those are some of the main islands. To get off the beaten path, I suggest heading to the Northern Aegean, or the Dodecanese. I spent a lot of time in Lesbos working on an olive farm. It’s one of the few islands in Greece that doesn’t depend on tourism to survive, so it’s busy year round with an active student population and a thriving olive and ouzo industry. This also makes it a unique cultural Greek experience. Mytilini is the main hub, and it’s a beautiful one. Make sure you grab a frappe at any of the cafes along the waterfront. Nearby Plomari is a perfect little town to spend a day strolling through, especially for its ouzo shops. Molyvos Castle is another great stop, and if you’re into crazy stuff, check out the Petrified Forest. It doesn’t look like much, but these fossilized remains date back to 20 million years ago. You’ll definitely need a car to get around if you’re travelling beyond Mytilini. A Greek language guide doesn’t hurt either. Also in the Northern Aegean, Chios is a gateway to Turkey…and consequently has been subject to much slaughter over the years. It’s a small but beautiful island, famous for its mastic trees which produce a sweet resin used in a great deal of products. I kind of ended up here by mistake, and didn’t really know anything about the island. But my Airbnb host named Maria took me under her wing and showed me around…and wow! She introduced me to Pyrgi, an unbelievable geometric town in the middle of nowhere. Also be sure to check out the medieval city of Mesta, and, well, poke your head into all the other little towns as well. There’s so much more for me to add! Keep checking back for more island info.